Meet Limor Fried, founder of Adafruit. I'm cross-posting this to both my woodworking blog www.CloseGrain.com and my software engineering blog FlinkAndBlink.blogspot.com (under the LearnToCode label), because even though there's no woodworking in it, this is all about building stuff, so it bridges the worlds. It's the maker ethos. If you're interested in learning to code, and building the stuff that you're coding on, this is for you. This is all about working on embedded systems, from the hobby level to the professional. I admit to instant and total nerd-crush. Limor Fried, who goes by the name Ladyada online (for Lady Ada Lovelace, The First Programmer) is the founder of Adafruit. Adafruit is a small electronics manufacturing company in Manhattan, NY, that focuses on teaching electronics to makers of all ages. You can read about them here. Electronics is another of those hobbies that I wanted to pursue as a teenager, but never could due to lack of funds. Fortunately I've advanced beyond that impecunious stage of life, and seeing this has fired instant obsession (hence the shopping list below!). I'm familiar with that feeling of obsession settling on my shoulders. It propelled me into hand tool woodworking, turning into a book. It propelled me into violinmaking. It propelled me into boatbuilding. Each time, the pattern is the same. I buy a bunch of books, watch a bunch of videos, dig through a bunch of blogs and forums, then buy a bunch of tools and start playing. Last year it propelled me into small engine repair and oxy-acetylene welding after I found Taryl Dactyl (yes, blog posts will be forthcoming). Now, in my copious free time (that's a joke, son), I'll finally be realizing that dream to get my hands dirty with electronics. I owe this to Matt Pandina, whom we recently hired at work. It quickly turned out that Matt is a maker and likes sharing information. He has some nice stuff on Google Groups under the moniker artcfox (in fact, one of his articles was coincidentally the answer to the embedded systems programming problem I use when interviewing candidates!). He made a comment about how Adafruit is doing manufacturing in Manhattan, and I asked, "Who's Adafruit?". That was all it took. Thanks, Matt! “We are what we celebrate.” —entrepreneur and inventor Dean Kamen. Kamen is one of my other heroes. She whose hero is my hero is my hero! I managed to score his autograph at the 2015 MassMEDIC conference. I was at the 2015 Embedded Systems Conference (ESC Boston), which was being held concurrently at the Boston Convention Center. 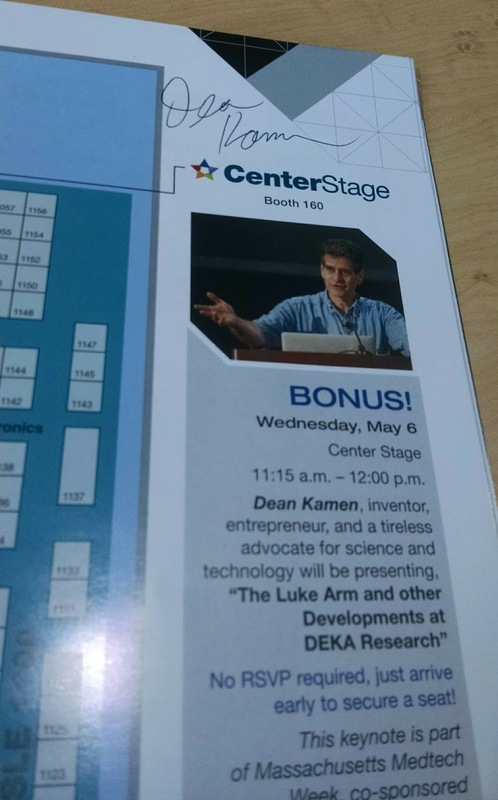 When I saw Kamen listed as keynote speaker, I scooted down early and got a chance to talk to him and tell him I wanted to work for him (he probably gets a lot of stalker geeks like that!). Came close the following year, but logistics didn't work out. On the business side, Adafruit sells kits, parts, tools, and books. That's pretty cool (along with being able to pull off a manufacturing operation in Manhattan). But what's truly spectacular about them is their online learning resources. Fried is a big proponent of open source, sharing the knowledge. So the Adafruit website is chock full of information. There's also an extensive YouTube channel. You'll also finds lots of cross-pollination with others in the maker community. There are magazines, blogs, and videos by the score, by independent makers like Matt, and by larger organizations. I've just barely begun to scratch the surface. This is great, because I know how to program embedded systems, but I don't know much about the components that go into them and connect to them. It's the combination of hardware and software that really makes something work. Pretty much everything I know about digital electronics I owe to Forrest P. Mims 35 years ago. Now, after that brief hiatus, I can take the next step. Soldering and Desoldering: how to solder components together properly, and how to pull them apart for salvage and rework. Surface Mount Soldering: how to solder surface-mount components. Multimeters: how to use a meter for basic measurements. Oscilloscopes: how to use an oscilloscope for advanced measurements and waveforms. 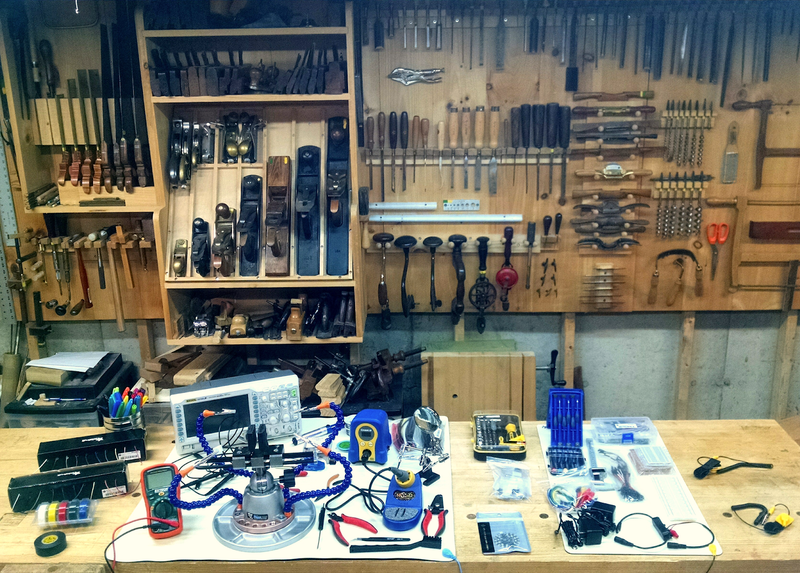 Hand Tools: the basic hand tools used for assembling and disassembling electronics. Schematics: how to read schematics (no, they're not Greek!). Breadboards and Perfboards: how to combine the parts on a schematic into a functioning circuit. Ohm's Law: understanding the relationship between voltage, current, and resistance. Once you have these skills, you are unleashed. Just like hand tool woodworking, it takes a little investment in tools and equipment, and a little time practicing with them. Batteries: the basics of using batteries to supply DC power to projects. Solar Cells: using solar cells to keep the batteries charged. Power Supplies: using an AC power supply to supply DC power to projects. Pulse Width Modulation: using a PWM converter to change DC input voltage to lower effective DC voltage, or as a simple digital-to-analog converter (DAC). Switches: understanding the different types of switches for manually controlling projects. These are the tools, equipment, supplies, and books to do the work. 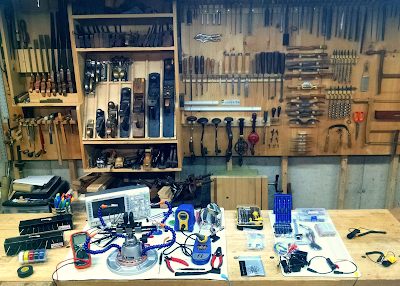 With the exception of the oscilloscope, these are all links to the Adafruit shopping pages. Prices as of April 8, 2018. StarTech.com 24x27.5-Inch Desktop Anti-Static Mat, $17.44. Anti-static mats are important for ESD safety, to avoid damaging sensitive components. Use this larger one as you primary work surface. Velleman AS4 Anti-Static Mat with Ground Cable - Desktop static dissipative mat - 11.8" x 22", $11.18. Smaller secondary mat for second work area. Rosewill ESD Anti-Static Wrist Strap Components, $5.99, one per mat. 3M Scotch #35 Electrical Tape Value Pack (5 colors), $10.10, because how can you build electrical stuff without electrical tape, color coded? Sharpie Fine Point Asst Colors (8 colors), $6.30, for color coded marking. Permatex 80050 Clear RTV Silicone Adhesive Sealant, 3 oz, $11.18. RTV is a universal technician's friend. Gobs of it serve as adhesive, sealers, hole plugs, gaskets, wire holders, vibration dampers, etc. There are a number of different formulations. Total cost: $1269 for everything (I ordered 2 spools leaded solder and 1 leaded Chip Quik, no lead-free items, 10 DC barrel jacks, and all the screwdriver/tool sets, since you never know which tips and shanks will fit, and some cases need special access tools to open), with free shipping from both Adafruit and Amazon. Plus they threw in a free half-size breadboard and a Circuit Playground Express. Back in my teenage days, $10 was a major expenditure, and $100 was simply inconcievable. This is starting to add up to some real money, but it will leave you armed with the tools, knowledge, and skills sufficient to launch a career. The really nice thing is that Adafruit provides a curated list of things to choose from, so you're getting the benefit of their experience and recommendations, all guided by that maker ethos. That was a big plus for me. Bridging three centuries of maker technology. Once I've gone through some of the books, I'll pick out a selection of microcontrollers to play with. You can read about my first use of these tools, since I needed them almost immediately. Exactly! That's where I got my Mims books, and all my parts (some of which I still have in their original packaging, fortunately IC's don't expire after 35 years!). Nice post! I'm another woodworker (http://www.woodnerd.net) with a background in embedded systems as the admin for http://elinux.org.